Koh Samui (Thailand) – January 26, 2018 (travelindex) – – Looking for a beach escape from the hustles and bustles of the city or a rewarding trip for the little ones during summer holiday? Make Koh Samui yours next holiday destination! Introducing a very special offer of 2018 for Thai Residents at Renaissance Koh Samui Resort & Spa. Rate starts from THB 4,500 net, inclusive of breakfast for 2. Imagine spending your days idling around our pool, just steps away from the private beach. Enjoy a cocktail (or two) before indulging in a blissful aromatic massage by the skillful therapist at Quan Spa. End the day by a romantic Thai dinner, overlooking the majestic Lamai bay at Banana Leaf, Tapas Bar or TawaNN. Can life get any better than this? The “Thai Resident” promotion is valid from now to 28 February 2018. Book this package directly to hotel reservation at kanittha.k@renaissancehotels.com or via telephone at 077 429 300. Renaissance Koh Samui Resort & Spa is nestled among lush gardens and only steps from the beach; the hotel sets the ideal stage for a tranquil getaway. The hotel boost 43 deluxe spacious and sophisticated rooms featuring tasteful decor and luxury amenities, while the villas provide access to private pool, along with mesmerizing views of the Koh Samui coastline. The hotel is committed to delivering exceptional experiences at Quan Spa, the5 well-known F&B dining outlets, 3 versatile meeting venues offering a total of 1,929 square feet of meeting and banquet space and 3 elegant wedding venues. 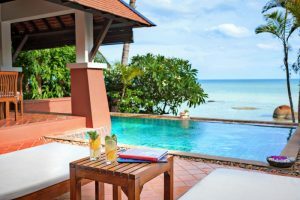 Marriott International, Inc. (NASDAQ: MAR) is the wRenaissance Koh Samui Resort & Spa is nestled among lush gardens and only steps from the beach; the hotel sets the ideal stage for a tranquil getaway. The hotel boost 43 deluxe spacious and sophisticated rooms featuring tasteful decor and luxury amenities, while the villas provide access to private pool, along with mesmerizing views of the Koh Samui coastline. The hotel is committed to delivering exceptional experiences at Quan Spa, the5 well-known F&B dining outlets, 3 versatile meeting venues offering a total of 1,929 square feet of meeting and banquet space and 3 elegant wedding venues.orld’s largest hotel company based in Bethesda, Maryland, USA, with nearly 6,000 properties in 120 countries and territories. Marriott operates and franchises hotels and licenses vacation ownership resorts. The company’s 30 leading brands include: Bulgari®, The Ritz-Carlton® and The Ritz-Carlton Reserve®, St. Regis®, W®, EDITION®, JW Marriott®, The Luxury Collection®, Marriott Hotels®, Westin®, Le Méridien®, Renaissance® Hotels, Sheraton®, Delta Hotels by MarriottSM, Marriott Executive Apartments®, Marriott Vacation Club®, Autograph Collection® Hotels, Tribute Portfolio™, Design Hotels™, Gaylord Hotels®, Courtyard®, Four Points® by Sheraton, SpringHill Suites®, Fairfield Inn & Suites®, Residence Inn®, TownePlace Suites®, AC Hotels by Marriott®, Aloft®, Element®, Moxy® Hotels, and Protea Hotels by Marriott®. The company also operates award-winning loyalty programs: Marriott Rewards®, which includes The Ritz-Carlton Rewards®, and Starwood Preferred Guest®. For more information, please visit our website at www.marriott.com.